Champion Demetrious Johnson won the UFC Fight that was televised January 26th on FOX. Post-Championship Update: One of our favorite athletes, Demetrious Johnson, won this amazing championship! Congratulations! We're Cheering for Demetrious Johnson in his upcoming fight and you can too. Tune in January 26th to watch him on FOX! For more information on the January 26th championship, click the link below to see the event poster and details. 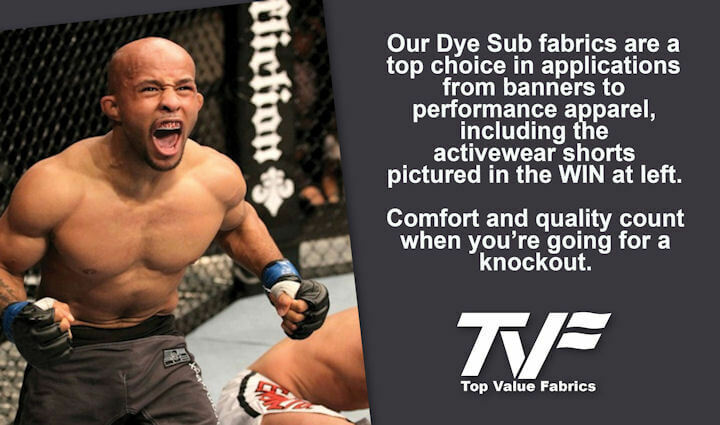 Top Value Fabrics is not affiliated with the UFC or FOX, but we are big fans of our customers and their customers. Click here to learn more about our dye sublimation activewear fabrics and the fabrics pictured at right. Top athletes demand comfortable, quality performance apparel...especially when a title fight is on the line.